Also, as Porretta pointed out, this very friendly competition is all about raising money for a good cause. PNB soloist Kylee Kitchens is a regular volunteer and supporter of RMH, said Porretta, and she has organized events there with the other dancers including Porretta. "We did one event where we cooked dinner for the families, which was great," he said. So Porretta was happy to pull on the kilt again. This year, he jumped barefoot for that Highland warrior look. While the photographer told him that they had all the shots they needed after the first couple jumps, he persuaded her to take a few more. 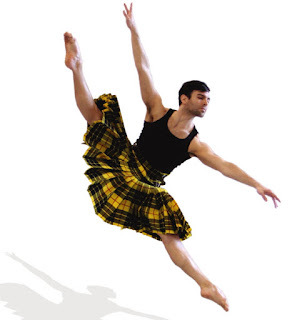 After all, Porretta said with his usual twinkle, "it's fun to dance in a kilt."